Carrier is one of the top-selling AC brands in the world, with a wide range of central air conditioners. The newer Carrier ACs are also among the most efficient currently available. Carrier has a very good track record for reliability and longevity. However, they do break down on occasion, and in our hot Arizona climate, getting them repaired quickly is very important. That’s our job at Scottsdale Appliance and AC Repair…and we work hard to do it very well. If your Carrier AC or heat pump needs service, we’ll come running with quick and reliable repairs. Our professional technicians have the best training in the industry. We fix all models of Carrier and have access to the area’s largest parts inventory. If we don’t have the right part on the truck, we’ll get it quickly and have the cool air flowing again ASAP. We also clean and tune up Carrier air conditioners so that they run at peak efficiency during the cooling season. This can help reduce your utility bills significantly. Our maintenance can also prevent expensive repairs from occurring or those that require you to replace your Carrier AC. We’re a certified Carrier AC repair specialist but we fix all brands and models. These include Trane, Lennox, Goodman, American Standard, Bryant, Rheem, Ruud, Heil, Armstrong, York and all of the rest. We have access to parts for all of them to ensure a fast repair every time. If you have an older AC and want to upgrade to a more efficient model or one that offers better climate control, we’re happy to provide you with a free estimate for a new system. 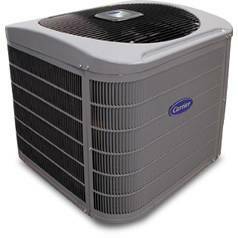 We install central air conditioners, heat pumps, air handlers and more. We can help you evaluate your old AC and decide whether the most cost-effective approach is to repair it or replace it. Our goal is to help our customers get the most value for their money! We do more than just Scottsdale AC repair. We are the top appliance repair company in Scottsdale, Fountain Hills, Tempe, Mesa, Phoenix and the entire area. Call us when you need any repair to your refrigerator, dishwasher, range, stove, cooktop, oven, garbage disposer, trash compactor, clothes washer or clothes dryer. Browse our testimonial page to see what others are saying about Scottsdale Appliance and AC Repair. We offer prompt and professional service at affordable prices. Call us today and we’ll come running to fix any brand of AC and any type of appliance!